Apathy - how many know about these campaigns who just ignore them? 'seen it all before' , 'nowt to do with me' , 'why should I bother' , 'its scaremongering', 'not going to happen'. Forums and Facebook pages abound with chat about new devices,swaps,coil builds etc but getting involvement in advocacy/petitions/collections is so bloody difficult. Some actively make this difficult (5th columnists - luckily few of those, but they do exist!) by hi-jacking and poisoning the purpose of the thread. I simply ask these people a question is it all about YOU? maybe it should be about giving smokers the same opportunity that we have enjoyed. YOU may be able to manage in the future,but what about the millions of smokers who will not have ready access to products or even forums? Broke - Undoubtedly times have been hard in recent years, but even a modest token donation of £1 boosts the totals and indicates both moral and financial support. A single 10ml bottle of bought liquid £3-£6! - could that money have been donated if you thought about it? Ignorance- Many excellent resources exist , there is no excuse to be in the dark! 1) No donations from you towards fundraising ? 2) Why not informing customers properly about important campaigns with newsletters,mailshots,Fb + Twitter entries? 3) Why not actively campaigning as above- Is anything on your website about ANY campaign ? 4) Why is activism in general ignored by you ? 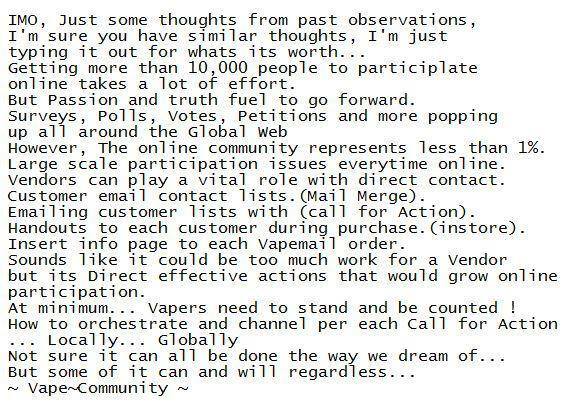 graphic courtesy of @VaEHp who points out what you already know, its the will to do it that's sadly lacking! I have heard many moans from the dedicated consumer activists about this irresponsible, incomprehensible lack of feckin interest from vendors who seemingly don't care a jot, why should they be left to fight OUR battle alone?